Year: 2002. Running time: 76 minutes. Color and Black-and-White. Directed by James Marsh. Based on the book by Michael Lesky. Narrated by Ian Holm. Features music by Yo Yo Ma, Debussey, Blind Lemon Jefferson, John Cale, and DJ Shadow. Aspect ratio: 1.78:1. In English. Stereo. DVD release by Home Vision Entertainment. In her introduction to the book Death Scenes: A Homicide Detective's Scrapbooka wonderfully macabre document of homicide photos culled from the private collection of "peace officer" Jack Huddlestonwriter Katherine Dunn states that the horrors contained within are ". . . an historical and cultural artifact, a time capsule that reveals seldom seen sub-strata of American life and death. One of the scrapbook's immediate effects is to deflate rosy nostalgia with the proof that there were no 'good old days.'" The same could most certainly be said about writer/director James Marsh's rhapsodic, occasionally chilling ode to the nightmare country that is Wisconsin Death Trip. Based on Michael Lesy's book of the same name, which has garnered an almost macabre reverence over the years since its publication in 1973, the film beautifully chronicles the secret history of life in Black River Falls, Wisconsin, circa the late-1800s and early-1900s. For whatever reason, the seemingly cozy hamlet of Black River Fallsits population largely comprised of Germans and Scandinaviansbecame a haven for the mentally ill, teenage random murderers, lovesick suicides, baby killers, a brick throwing, coke-snorting anarchist, and a host of other bizarre and aberrant behavior that ultimately said more about the populace than any sentimentalized portrait of earnest, God-fearing country people ever could. As documented in the town's newspaper, police logs, diaries, and most memorably through the pictures of the town photographer Charles Van Schaik, the evidence of Black Water Falls' epidemic of madness and violence has been more than well preserved. Utilizing Van Schaik's photographs of small town death and desire, as well as the actual news clippings from the time, director Marsh skillfully combines dramatic reconstructions into the mix and ends up with a film that is surprisingly more akin to Terrence Mallick's Badlands or Days of Heaven than, say, America's Most Wanted or Unsolved Mysteries. Much of the film's power also stems from Ian Holm's matter-of-fact narration, wherein he reads newspaper accounts reporting on the macabre proceedings with a perfect balance of irony, sympathy, and fascination. Although Holm's bodiless presence in the film could have easily been intrusive or distracting, the deadpan delivery only adds to the inexplicable occurrences playing out on the screen. The tragedy, sadness, horror, and mystery that flow through the film unfolds like a dark lullaby, a sinister reminder that the undercurrents of crime, madness, and death have always been with Black River Falls in one form or another. Scenes set in modern-day Black River Falls illustrate that the legacy of doom that plagued their forefathers still haunts the residents to this day. Home Vision Entertainment's DVD offers up the film in a splendid transfer, perfectly showcasing Eigil Bryld's crisp black-and-white cinematography. Bryld, along with director Marsh, contributes to an occasionally interesting commentary track that focuses more on the production of the film than the death trip events themselves. More worthwhile is the twenty-three minute documentary, Midwestern Gothic: The Making of Wisconsin Death Trip, which includes numerous interviews with the mostly non-professional cast, and documents some of the many problems that plagued the small film crew as they stretched production through all the seasons in an attempt to chronicle a year in the life of these amazing and unforgettable figures of the past. Music critic Greil Marcus also contributes a short essay about the film, and considering his own interest in the old, weird America, it's too bad that he wasn't able to participate in the commentary track. 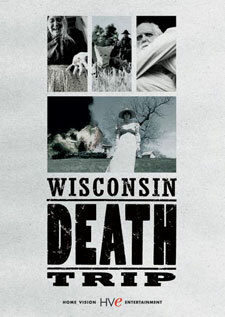 Wisconsin Death Trip is now available on DVD from Home Vision Entertainment in a new high-definition digital transfer that has been enhanced for 16x9 televisions (aspect ratio of 1.78:1). Special features: commentary by director James Marsh and director of photography Eigil Bryld; deleted scenes; Midwestern Gothic: The Making of Wisconsin Death Trip; an essay by Greil Marcus (Rolling Stone, Village Voice, and New York Times contributor). Suggested retail price: $29.95. For more information, check out the Home Vision Entertainment Web site.